If you are new to studying you might be worried that your powers of concentration and memory are not strong enough for the study tasks which lie ahead. Many people feel like this – especially if they are returning to education after a long break. If this is the case, here are two immediate items of reassurance. 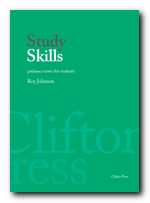 You are likely to develop your powers of concentration with study practice. You will not have to rely on your memory as much as you probably imagine. Most people will develop their powers of concentration with no difficulty. It happens fairly naturally as they gradually become more familiar with their subject. This is the same as any other activity. If you are not used to doing something, the task may seem difficult at first; but as you develop your skills with practice, it will become easier. There will not be as much need for memorising information as you probably imagine. Except for a very few disciplines which require the memorisation of facts, most subjects will put their emphasis on your being able to think clearly and make intelligent discriminations. In addition to this, your memory will become more efficient with practice. Your ability to concentrate will normally be proportional to your study experience. If you are just starting, split your study into short manageable periods. Each period should be punctuated by a short pause to give you time for rest and recovery. Have the self-discipline to start work again as soon as the pause is over. Don’t invent excuses for yourself. As time goes on, you will find that these study periods will expand of their own accord. You will be developing your ability to engage with your chosen subject. Normally, your sense of interest and pleasure in studying will help this process. Once you strike up a rapport with your chosen subject, studying will seem easier and you are likely to forget about problems of concentration. Time will pass quickly and easily. In the early stages of study, if you encounter new material which is difficult to understand, go back to shorter study periods. You will grasp difficult or complex issues if you break up the material into discrete, manageable sections. It might be better to spend three or four periods of half an hour spread throughout a day, rather than a single two hour stint which grinds to a halt after three quarters of an hour. Don’t force yourself if you are tired or stressed. You are not likely to absorb your study materials properly in such conditions. This time would probably be better spent recovering and creating a healthy state of mind in which to start work afresh. In order to be efficient, you need to be in good physical and psycho logical condition, which is one good reason for looking after your health. If your concentration keeps wandering and you feel that your study is becoming unproductive – be prepared to stop. Make a note of what you still need to cover, then switch to some other activity – possibly something more passive such as listening to audio tapes. If all else fails, start afresh the following day – but keep in mind the topics you may still need to cover. Have an overview of your tasks in mind. There will be times when study involves a lot of hard intellectual work – so be prepared! Sometimes you will have to drive yourself. When things become difficult, don’t introduce pauses into your work as an excuse for giving up. These arduous periods should become fewer as you become more closely acquainted with your subject. You will concentrate more productively on your learning tasks if you create the best possible conditions for study. You should study in isolation if possible; you should be free from distractions and interruptions; you should be in comfortable surroundings; and you should have all your study materials to hand. Your ability to retain and recall information will grow as you develop the intellectual framework into which new details from your studies are fitted. In a study of history for example you are likely to develop a sense of the chronology of events. Once you have developed a ‘mind map’ or a mental checklist of the nineteenth century (for instance) you will slot into its appropriate place some new piece of information related to 1836 or 1897. Wall charts can be helpful here. Make sure that your study materials are pitched at the appropriate level. If you are just starting, read one or two books aimed at an introductory level to get a general idea of your subject. This will provide you with an understanding of the main issues. Don’t make the mistake of trying to plunge straight into textbooks which are written for advanced studies. Good note-taking and revision skills will help you to grasp the essential of your subject. Some students regularly review their notes to make sure that they have a firm grasp of all the material studied on the course to date. In revising for examinations, some students carry round a condensed version of their notes and course topics written on index cards. Some students find it useful to use mnemonics as an aid to recalling commonly used information. A mnemonic [which is pronounced without the initial m] is a device in which one thing is remembered by means of another. For instance, the notes in the treble clef of a music stave are (on the lines) E,G,B,D,F and (in the spaces) F,A,C,E. These are commonly remembered as Every Good Boy Deserves Favour and the single word FACE. These mnemonics need to be short, sharp, and effective. If they are too long or complex they might take as much effort to remember as the subject(s) they are supposed to summon up! Don’t make things more complicated than they need to be. Many people have a very visual memory. That is, they can remember the picture or shape of words on a page or items which have been represented as symbols or images. This is a case where the clear layout of notes may help you to remember their contents. It is quite common for people to remember quite complex issues if they can be presented in a visually simple manner.